Researchers and students in anthropology and archaeology; forensic and medical scientists; and libraries. Dr Craig Cunningham is a senior lecturer in Human Anatomy within the Centre for Anatomy and Human Identification at the University of Dundee. He holds a joint honours Bachelor of Science degree in Anatomical and Physiological Sciences and a Doctorate in Anatomy and Forensic Anthropology. He is an anatomist and practising forensic anthropologist accredited at FA1 level by the Royal Anthropological Institute. He has worked on a number of cases as a forensic anthropologist within the UK which has included the investigation of both adult and juvenile remains. He is involved in the teaching and supervision of undergraduate and postgraduate students in anatomy and forensic anthropology and has responsibility for the curation of the Scheuer collection of juvenile skeletal remains housed within the Centre for Anatomy and Human Identification. His research involves investigating the growth and development of the human skeleton through the use of non-invasive imaging methods. He is a Fellow of the Royal Anthropological Institute and holds a Scottish Government license as a teacher of anatomy. Professor Louise Scheuer is a retired anatomist and forensic anthropologist who taught at several London medical schools including 20 years at St.Thomas’s Hospital Medical School and the Medical School of University College London. She is a past President of the British Association of Clinical Anatomists and holds an Honorary (Chair) Professorship at Dundee University. She is a member of the Anatomical Society of Great Britain and Northern Ireland, the British Association of Clinical Anatomy and a Fellow of the Royal Anthropological Institute and of the Royal Society of Medicine. She and Sue (Prof.) Black held a Leverhulme Grant for the conservation and re-evaluation of the St. Bride’s Church skeletal collection. She has worked with forensic pathologists, coroners and police on the identification of human remains and was a forensic anthropologist in the British Foreign and Commonwealth Team investigating war crimes in Kosovo in 1999 and the team examining the 7/7 London tube bombings in 2005. She is the past Chairman of the Forensic Examination Committee of the Royal Anthropological Institute. Professor Sue Black is Director of the Centre for Anatomy and Human Identification at the University of Dundee, Director of the Leverhulme Research Centre for Forensic Science and Deputy Principal for public engagement. She is a forensic anthropologist and an anatomist, founder and past President of the British Association for Human Identification, and advisor to the Home Office and Interpol on issues pertaining to forensic anthropology in disaster victim identification (DVI). She is a fellow of the Royal Society of Edinburgh, a Fellow of the Royal Anthropological Institute, a Fellow of the Royal College of Physicians (Edinburgh), a Fellow of the Royal Society of Biology and a certified forensic anthropologist. She was awarded an OBE in 2001 for her services to forensic anthropology in Kosovo, the Lucy Mair medal for humanitarian services and a police commendation for DVI training in 2008, Hon Prof of Anatomy for the Royal Scottish Academy in 2014 and the Fletcher of Saltoun award for her contribution to Scottish culture also in 2014. She was awarded both the Brian Cox and the Stephen Fry awards for public engagement with research and in 2013 her Centre was awarded the Queen’s Anniversary Prize for Higher and Further Education. In 2015 she was awarded a £10M grant from the Leverhulme Trust to set up a research centre for forensic science. 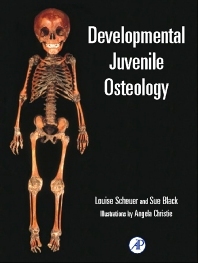 Louise Scheuer teaches anatomy and dental anatomy to undergraduates, and forensic and archaeological osteology at the postgraduate level at various medical schools thoughout London. She holds degrees in zoology and anatomy, and is particularly interested are in the developmental anatomy of the juvenile skeletons, the biology of past peoples, and in the field of skeletal identification in forensic investigations. Sue Black holds a Ph.D. Human Anatomy. She has done research into methods of identification from human skeleton. Her research interests include all aspects of skeletal identification, particularly in relation to forensic investigations.